I got to break in the Rio last night at a gig, sounded oh so sweet. I switched between both channels but couldn’t figure out which one I liked the most. They both sound great and the tremolo really sweetened it up. Thanks again for doing what you do. We’re all lucky because of it! Y'all GOT To See This! We love Harleys and we love guitars, so you can imagine how excited we were when we stumbled across a gentleman who actually combined the two to make a guitar made from Harley parts! Called the “Hog-O-Caster,” custom guitar maker Terry Johnson’s labor of love is named with both Harleys and Fender Stratocasters in mind ....... CLICK HERE to see complete article and video of Terry and the Hog-O-Caster in action. from Society Of Rock website. 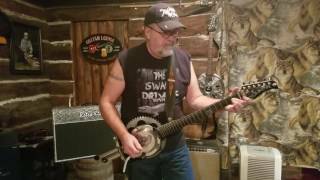 Retro King Amps, Owner Chuck Dean at (315) 673-3435... Hi, This is Terry Mojo Johnson of the Swamp Drivers band. I own over 7 different amps from old Fenders to Marshalls and a few in between. This Retro King amp blew me away with the tone and volume, and the look... That's just badass. I recently picked up a used Plexi 100 on Reverb. I love the way it sounds - it has the perfect amount of bite to balance with the punch from my Germino Headroom 100 Lead. I run both of them with a Lone Wolf Audio Outsider to boost them into full distortion. I mostly play sludge and death metal, which I'm guessing is not the style you had in mind when you designed the circuit, but I have a fairly unique view on guitar tone, which is more or less that amp design peaked with the Super Lead. Anyway, just wanted to let you know that I'm really enjoying your amp and it's being used way outside the bounds of blues and classic rock, which is a testament to its versatility. Thanks a lot for your time! Hope all is well, I wanted to share a few things I've been doing with my RetroKing. The demo videos are on Sweetwater.com and the Gibson video went out through their social media. I write for 17 tv shows and use my RetroKing on 90% of the tracks I do. I'm currently in an ad for Premier Guitar magazine and I'm in the new April issue of Guitar Player Magazine. I have an instrumental EP coming out at the end of the month and of course my RK is on most of it. Please checkout my updated website and facebook, cuz I'm always posting videos of live shows and you'll see the RK on a bunch of them. Thank you for listing me as an artist on your site and I hope we can do some official demo videos for more of your great amps, so please let me know your thoughts. These last days i had a lot of fortune! I always thought that it would be impossible, but yes! I found a RETRO-KING "Forty five" Combo for sale in France! I asked some informations to Sylvain who was ex RETRO-KING dealer in France, and he told me your amps are awesome (sound and construction quality), much better than Marshall reissue. This amp looked as new, so i purchased it. I wanted to send you this message to tell you some words about this amp. I think you are a great builder! This amp is the best one i ever played with. All the external construction is perfect, inside is very good, and the sound is really INCREDIBLE! My guitars never sound like this. The clean sound is awesome, really like old Marshall amps. I dreamed about having a good JTM45 that would be built as the old ones, without PCB, etc and overall with the authentic tone. Now i think my search is over. This one will play with me forever! I know that i don't purchase directly to you, but i think it is important to tell you this few words because you are a King of amps builder! The americans are fortunates having RETRO-KING in their country, and you can be proud of your work. Thank you very much for this fantastic amp. Hi. Been about 2 years and have been meaning to let thank you for building me my first custom amp. You totally [and patiently] took time with me, answering tough, weird questions, and built me an awesome 18 watt. Very reliable and tone that was so sought after. I think you actually built a perfect amplifier. Thanks again. I received my 18 watt combo on Friday and I couldn't be happier with my purchase. Before even plugging in, I was amazed at the flawless construction of the cabinet. Every detail was executed perfectly and the green tolex really makes the amp stand out as something special. When I plugged in my guitar, I heard the tone that I've been looking for since I started playing guitar. Every sound out of this amp is clean, tight, and sweet. As the sound breaks up (and I love the large amount of clean headroom!) the guitar's tone comes through nice and clear and this amp maintains superb note separation. I'm very please with the speaker combo (AlNiCo Blue/G12H30),it fills the room with a nice full stereo sound. The tremolo sounds fantastic, the tube/diode rectifier switch is handy, and the impedance switch makes potential speaker changes a breeze. But most of all, the post-PI master volume is what sets this amp apart. I never thought I'd find an all tube amp that I could crank up to 9 to drive the tubes hard enough to get that Angus Young distortion while not waking the baby (and maintaining a clear, natural guitar tone), but you've done it. The craftsmanship, beauty, and tonal quality of this amp is unmatched and I payed less that I would have for the "assembly line" boutique amps. I applaud your work, Sir! Just wanted to send you a note on how much I am enjoying gigging with the 18watt 2x12 you made for me. I am getting so many compliments on my tone. The amp is great for all the different size venues we have been playing and even on the larger festival stages the stage volume is perfect, just mic it and go, I also used the line out circuit you installed and blended with the mic for stage and recording, Sounded great! The amp takes all my pedals so well and that gives me so many great textures for live playing. I cannot thank you enough….I am thinking I am going to have to order a 50 watt combo in the future, not that I need it with the 18 but I know it will sound Sooooo Good. as well as switching to 16 ohms on the selector? Thank you for your time, and thank your for your tone. 18 watt combo 2 x 12 arrived 10 days ago. I am amazed!! It overwhelmed me. I have heard a lot and tested a lot of different amps -with much higher price than the Retro King. If you are from outside US and are afraid of ordering - do not hesitate. It was delivered 2 days before time with Fedex. And very well packed and protected. I actually had my first gig in a church at a funeral. Just me , my sister on the piano and of cource the Telecaster and The Retroking. This was an old church with noe PA for my singing. So I was really happy that the amp had pi master volum. It was working fantastic at a low volum. So many responses from the audiences. I just used the Tc electronic reverb - an analog eco from Wampler pedals. Together with the tremolo - sweet, sweet. The day after we had a gig at a local pub. Here had a lot of different pedals - and it takes pedals very well. I only needed the pi master at 10 o clock. It has a lot of headroom and breaks up nice and warm when cranked. The guitar used is a telecaster 50´s and a Les Paul traditional 50´goldtop. This amp is really getting the best out of my guitars. I am really looking forward to all the gigs this summer - and thank you so much Dean for the amp and the service!! I Used my Retro-King in this video: http://www.youtube.com/watch?v=JI52FDfdPkE"
As you know I have purchased two of your product’s, first being the 45 watt bluesbreaker combo and more recently the 18 watt plexi, let’s talk about the bluesbreaker, this amp is an absolute tone monster it is so versatile an amp I think it would be suitable for any kind of music you can get anything from Eric Johnson, Angus Young, to Eric’s “Beano” sound and experimenting with different pedal’s it can emulate a Fender Bassman there’s no need to have a selection of different amp’s this amp does it all, as for the 18 watt plexi what can I say, I consider it my “mini bluesbreaker,” fantastic amp. When I purchase an amp one of the first thing’s I do is to pull the chassis and inspect the work and component’s inside and with my most recent purchase the 18 watt, the attention to detail from solder joint’s, wiring to turrit board layout is second to none, absolutely great work. I can see you have a lot passion for your amp building business. Thank you Chuck. Lindsay, 1/2012. Chuck, I just wanted to let you know since I picked up my 18 watt combo from you I haven't even plugged any of my other amps in. This thing is out of this world, I love it. I just wanted to thank you, I'm so glad I made the desicion to go with Retro-King amps. Rich. chuck, just wanted to check in from down the road in rochester. i finally have a couple of practices w/my band playing through my new amp you made me. first off,the snakeskin covering looks amazing,& the slightly taller 18 watt head box is just perfect.looks cool,takes up less room...& it truely is a custom made 1 of ! soundwise...it's everything you said & i wanted.teles,strats,gretsch, p-90 pauls,my dano slider...all never sounded better.i thought i'd be playing through my closed back avatar bluesbreaker style cab w/ 2 30 watt celestions,which sounded great,but after hearing it through my old faithfull peavey 1x15 classic extension cab loaded w/a weber chicago ceramic 15...it just blew my mind.my drummer is just freaking out.we play pretty cranked up,but even wound up past 3/4 volume you can still get crisp note definition,& controlled feedback w/sustain for days ! fri. will be my first gig w/it & i'm a giddy mofo just thinking about it.my bass player posted a photo of it on my tweed 1x15 cab for his myspace page,It he tells me it drew an awfull lot of "oohs & aahs" already.i'm sure fri. night it will get the same response tonewise as well as the "man,that looks cool as hell" comments i've been getting. thanks so much for hooking me up,doing the cash thing,the custom head box,& even getting it finished early ! i'm really thrilled w/the tones i'm getting & with the ease i'm getting them with ! i'm so glad i found out about you & took the ride down the thruway.one of my better moves. again...thanks for a wonderful instrument,keep up the good work ! Hi Chuck, not that you need anymore endorsements or testimonials but after 2 months with the 18 watt (1-12) combo you custom built for me, I must say it's an addictive piece of gear! The more I play it, the more I want to play it!! It amazing that such a simple design in an amp can provide the tone it does. At lower volumes you get the chime and just a little bit of grit but with clarity, articulation, and even balance across all strings. But the fun really begins getting this up between 5 and 6 on the Master Volume with the Volume dimmed. It still retains all the aforementioned qualities but now it fills in with that Marshall (Old Marshall amp that is) crunch, balls, and sustain. And at first I thought the 18 watts may not be enough, but it is a loud 18 watts and perfect for my particular needs. There is just something about this 18w design that sounds sweeter than any of the amps I have had, and that covers about 40 years and who know's how many amps. Keep in mind that in the past I have had numerous 18 watt combo's to include the Marshall 1974x reissue, GDS, Reinhardt, BlockHead First Born, Bacino, Ceriatone etc. etc. All are good amps but the Retro-King has the magic dust. My gear acquisition syndrome has reached an end finally! That is until I order one of your JTM45's. Keep up the great work and thanks for building such a fine amp. at about 10 o'clock in the non trem channel. playing a Strat with a humbucker in the bridge for maximum Angus. bomb can do. Its for sale on our web page as is the combo version. Chuck, great amp. I bought #15 off Ebay and was kind of giving up on boutique 18 watt amps when this puppy arrived. I played my first gig with it this Sunday afternoon (see pics) and was laughing remembering your slogan saying this is the amp "every sound man will thank you for". This sound guy kept telling me to turn down and couldn't believe I was just playing 18 watts. The amp sounded too good cranked at 8, so luckily I had a few Clear Sonic pads in my car to put in front of it. Just endless beautiful tone, works perfectly with my pedalboard, and I didn't even need the extra 212 cab I was rehearsing with at home. This has to be one of the most efficient amps on the planet. Thanks again for the great tone. I just got my 18w Combo yesterday and I must say THANK YOU! It is a beautiful piece of work, in all ways! The fit and finish is flawless, but most importantly, the tone is to die for!! I am obviously still getting to know the amp, and the speaker is far from broken in, but even still, it is a tone monster and I love it! As I become more familiar with the amp, I will post a review on Harmony Central for the amp and cannot wait to let all my guitar-playing friends hear this amp. Again, my most sincere thanks for building such a quality product. The 18 will play nice and clean or with a turn the Post PI knob, produce great gain. Les Paul or Strat, it sounds great. I can really get some cool sounds. Clean channel, dark channel or jumpered, Rectifier switching and Post PI volume combinations. From clean, to slight break up, singing gain or grease fire. This thing has what I dig in an amp. I am very pleased with your craftsmanship and attention to capturing the real cool tones. Out of the twelve amps I own. This Retro-King Plexi 18 is the top of the heap. Talk to you soon. Last Saturday night I met Billy Gibbons briefly, and I asked him if he had any recommendations for a 5 watt amp. He responded that he had one for an 18 watt, and I asked what it was. He then suggested contacting Charles Dean, who made Retro King amps, and suggested getting the 2x12. This was after a show, and I honestly don't think I'd be exaggerating to say that he seemed to become energized when talking about your amplifier. I'd say he would have talked some more too, but the security guy was urging me along to allow time for the other fans. So I figured I should certainly check it out. I've looked around your website, and I think I can tell at least some of what his specs were in the ones that you built for him, but was hoping you would be able to provide those specifics, and what it would cost to have one built. I'll preface my review with the claim that, I've never been a huge Marshall amplifier fan. I favor Vox, both ancient and re-issue, (UK made only) and an AC30 is my constant companion. I was immediately intrigued when an associate tipped me off on Chuck Deans' Retro-King amp designs. I decided to take a shot ! There was no way at this price I could go wrong ? I ordered the 18 watt Class AB combo for January delivery. The amp nails the signature Marshall gritty overdrive distortion that you've heard on so many recordings... I immediately found musical and quite useable sustained feedback at moderate volumes... Those EL-84's in combination with the circuit design give a great chiming Brit tone I love. At 18 watts, it's no mousey amp. I rarely had to play as loud as 5 (out of a possible 10 volume detent), and found my comfort at 3 1/2, using my volume controls on the guitars as a master. The amp at an A weighted response of 95 decibels sounded fabulous. Want meltdown Marshall tones ? Play 7-9 if you dare ! Those automatic Clapton riffs I've played for years sounded as authentic as one can hear with this amp ! The Telesonic with Keeley compressor and with it's dual 2K DeArmonds sounded best... Even without my Keeley, it's highly recommended to plug in and play this amp. It's a killer combination with your favorite mahogany guitar, guaranteed ! The ES-335 with its larger body, gave me the Creamy tone that surely sounded rich and textured, yet authentic. Call me in a couple years ! This amp feels like it can easily handle the rigors of club touring. I do recommend a decent padded cover at minimum, to keep it from getting dinged. The amp covers a 5 year bumper-to-bumper warranty with 90 days on valves and 1 year on loudspeakers. Want the tried and true Marshall tone ? No matter your skill level, you'll find this amp a pleasure. Easy to dial in the gold... this amp will be a friend for years to come. Studio owners, this is a really great sounding combo to add to the arsenal. It won't break your budget either. $1645 as tested. Try getting a custom amp at this price today... (The Marshall Handwired re-issue 1974X 18 watt combo is $2300 bucks, by the way.) If you really know the market, there's no contest here. It's a fun amp to own, and it looks great. Mine has the cocoa brown levant tolex covering, with the Marshall cane grill cloth. It's also an amp you can lift without killing your back... No gamble here, you will be satisfied. I'd replace it in aheartbeat with an identical model ! Instruments that I play and tested for this review were: a Robert Keeley Compressor, Monster Guitar Cables, Gibson ES-335 dot Custom Shop model, Fender Telesonic and Mini Moog Synthesizer.- Supercat, Upstate, NY. The predominant feature of the Plexi 50 is its great musicality and beautiful tone. The high treble channel is not as bright as those found on some Marshalls nor the nornmal channel as deep. The bass is tight on both channels and the frequency response very balanced. The tone is of course affected by the speaker cabinets. My set up is through an 8 ohm 80 Watt Dr Z 2x12 closed back birch cabinet mounted with vintage Celsetions. The lower the wattacge, the more break up. Depending on volume and eq settings the Plexi 50 can achieve a remarkable variety of tones. Easily accessible are AC/DC, Led Zeppelin, Ritchie Blackmore and Hendrix type sounds as this amp is very much in the same vein as the equipment used by these players. Also achievable with varied EQ settings are Eric Johnson, early Mahavishnu and DiMeola type sounds. Thus the amp ranges into fusion territory. While not specifically built for the heavily saturated distortions of modern rock/Metal, the amp is versatile enough to be used for this music with the appropriate pedals. In addition, the Plexi 50 is very "alive", touch reponsive and sensitive. Turn down pickups and it cleans up beautifully. Play harder and it distorts more. My guitars include a Les Paul Standard with 490R humbucker in the neck position, and burstbucker at the bridge, and an Eric Johnson signature strat. Pedalboard includes a Fulltone 70s Fuzz, Chandler Tube Driver, Boss DS- 1, Boss DD-2, Electro-Harmonix Memory Man and TC Electronics Chorus. The amp interacts beautifully with the various pedals, but is more noisy as all pedals are in front of signal chain- (no effects loop here, of course). The analog and digital delays come out sounding beautiful, even with volume at ten-(think Eric Johnson's wet sound on Cliffs of Dover). Charles Dean, maker of Retro-King amps is responsive, understanding easy to work with and easily accessible. Try getting this kind of service from Marshall in England or makers of other similar amps. Amp was built in the exact time specified, delivered as expected and works perfectly. I have only had the amp for 1 month, but its tight construction and simple design lead me to believe that it will last as long as many Marshalls built 40 years back. I am a guitarist of some 20+ years experience and currently play in a classic/modern rock cover band (as a hobby) that also does some originals. We cover anything from ZZ Top, Cheap Trick etc. to Nine Inch Nails, Nickelback, even Pat Benatar. Other amps are a Guytron GT-100 head, 74 Silverface Vibrolux reverb, 20th anniversary Hughes and Kettner Combo and a Polytone Mini Brute IV for Jazz work. One essential to remember for guitarists looking for that famed Marshall sound. The Plexi 50 are priced at half of the new hand-wired Marshall equivalents and half of the Blockhead and Mojave amps. I have auditioned the latter two and like the Retro-King better. What a find if you’re looking for a great all around amplifier!!! I finally got a chance to put my 18 Watt Head (white tolex w/gold piping) through its’ paces and I couldn’t be more impressed. We tried a variety of guitars – ’61 Relic Strat, ’57 Junior, CS Esquire w/P90 in the neck, Ibanez “lawsuit” Flying V and a RI Gretsch 6118T Double Anniversary through a ’73 Marshall 1960A Cab w/original Greybacks and in each case the guitars retained their individual character. The guitars’ volume and tone controls have a great effect on the ability of the amp to get a wide variety of very usable tones at any volume. Varying your pick attack also adds even more to the wide spectrum of tones available. We ran the amp through the full range of its’ controls and found a different sweet spot for each guitar – mostly between 12 o’clock and 3 o’clock on the volume with the tone adjusted based on the pickups in the guitar. Even when the amp was “dimed” it retained its’ character and string definition was not compromised. Next we tried the head through several different Cabinets and speaker combinations – ’71 10982A w/original G12H 30’s, Celestion Blue 2 X12” Cab and three Marshall 4 X 10’s. Each of the Marshall’s had a different set of speakers - one with a mix of Weber Silver 10’s and Blue Pup’s, the second with four Weber Thames and the third with original ’69 Marshall 9384 Greenbacks. Each of the five cabinets sounded great and offered their own character to the Retro King. Based on what we heard from this amp it’ll work with most any cabinet or speaker combination. To me it seemed to find its’ comfort zone with the original Celestion 9384’s or the mix of Weber Silver & Blue 10’s. The other two guys didn’t think the pairing with the ’73 Marshall could be improved on!!! The Retro King 18 Watt Head would be a great amp for any small or mid sized club. It will also get a ton of use in either a home or recording studio with its’ wide variety of tones and the way it compliments any guitar you plug into it. A cool feature that Chuck offers on the tremolo channel is the way the two button footswitch offers on/off and the ability to toggle between two different speeds when engaged!!! The component choices and workmanship are both top notch and add to the overall character of this amplifier. The stock tube compliment that came with the amp sounds great but I imagine that swapping different preamp and power tubes to tailor your sound would be a very rewarding experience. Give this amp a try and you’ll find a bunch reasons to make it your amp of choice. P.S. I had Chuck go through my JTM45 RI with a PTP upgrade and he reviewed the components and workmanship for any errors. He then offered some suggestions to tweak the circuit to improve its’ overall sound which gives me an ideal amp for any larger venue. I get many compliments on how great my “Marshall” sounds and that it really stands out in the mix. If you have ever purchased a new mass produced Marshall amp and kicked yourself because it did not give the sound that you heard on your favorite records, then run out and purchase a Retro King 45 or Retro King 50. Charles Dean hand makes these amps and signs every one and the sound is the real deal; which I have never been able to obtain with a stock Marshall. Why would anyone purchase a mass produced amp when a hand built boutique amp can be had for nearly the same price? I purchased a Retro King 45 and a Retro King 50 and I love them both. Wow ! This light ( I think about 40lbs.) 18 watter is amazing. delivers just the perfect single coil grind i was looking for with my strat & with the Les Paul loaded W/ Dimarzios think Clapton... Bluesbreakers...1965...Mayall ! I thought it might be a little underpowered for gigging , but it's a lot louder w/ far more bark than my 22 watt blackface Deluxe Reverb. It also cleans up very nicely when you roll-off the guitar volume knob. The tremelo effect is very big & warm. I ordered mine in red tolex w/ a weber 1230 12" speaker (weber's reissue of the famous Celestion G12H30). Chuck has been very responsive with a couple of technical questions that I had. If the amp were ever stolen, I would definitely replace it. I recently purchased a Retro-King 18W. I have owned Marshall 18W amplifiers. I have to admit that the Retro-King is as great an amp as the Marshall 18W and at a fraction of the price. An excellent Rock/Blues/Jazz amp. I use it with both humbucker and single coil guitars. This is a workhorse amplifier with major Mojo.